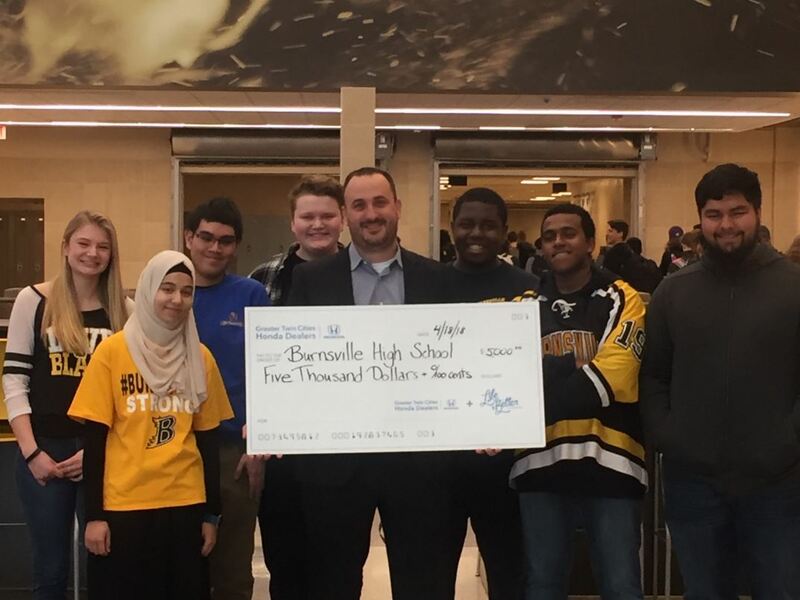 The Greater Twin Cities Honda Dealers donated $5,000 to Burnsville High School. BURNSVILLE, Minn. - April 18, 2018 - PRLog -- Walser Honda of the Greater Twin Cities Honda Dealers Association (GTCHDA) presented a check for $5,000 to Burnsville High School on April 18. The donation is part of the GTCHDA's ongoing campaign, "Life is Better Thanks to the Greater Twin Cities Honda Dealers," where each dealer selects local schools for a donation up to $5,000. Dan Resch, general manager of Walser Honda, said, "We have a long-standing relationship with Burnsville High School. And, when it was our turn to select a school for the 'Life is Better Thanks to Greater Twin Cities Honda Dealers' campaign, the choice was easy." Along with Resch, Nancy Warner, Walser Foundation's Director; Kathy Funston, Ed.D, Burnsville High School's Director of Strategic Partnerships and Pathways; and Burnsville High School Superintendent, Cindy Amoroso, were in attendance for the check presentation ceremony. Since 2016, the Walser Foundation has supported Burnsville High School through donations to the school's automotive program. To date, the foundation has given $275,000 to upgrade the program, and provide the same state-of-the-art equipment that is used in dealerships. Beyond the donation, the Walser Group has maintained a continued partnership with the Burnsville-Eagan-Savage School District 191. This partnership has boosted learning opportunities for Burnsville students, and supports a "future-ready employment base for the automotive industry." More specifically, the high school's Engine and Automotive Technology career pathway centers on providing relevant real-world skills and experiences that align with industry standards and expectations to its students. "The automotive technology field provides more than 10,000 specialized jobs in Minnesota," said Amoroso. "Through our specialized, redesigned high school programs, we are able to offer a series of classes, [such as the] Engine and Automotive Technology pathway [where] students can explore careers, prepare for post-secondary education, or find work after high school." To date, the GTCHDA has donated $25,000 to local schools. To learn more about GTCHDA's community involvement, please visit the GTCHDA Facebook page and YouTube channel. About the Greater Twin Cities Honda Dealers: The Greater Twin Cities Honda Dealers consists of eight Honda dealers serving the greater Twin Cities area, including Buerkle Honda, Inver Grove Honda, Luther Brookdale Honda, Luther Honda of St. Cloud, Luther Hopkins Honda, Mills Honda, Richfield Bloomington Honda, and Walser Honda. Learn more at https://www.GreaterTwinCitiesHondaDealers.com.